In case I haven't mentioned it in the last ten minutes, I don't like winter. I bring this up again this morning as I look out the window at a snow and sleet covered mess outside. It's also Groundhog Day but I doubt he can see his shadow or even dig his way out of his burrow. Sigh. Still, all this inclement weather means more time in my kitchen. And it's all a bit more bearable when I can get some of Florida's sunshine, at least in citrus form. New York might be covered in snow but Florida grapefruit as at it's peak. From January through March, Florida's subtropical climate produces the best fruit. It's easy to pass it by because the outside is typically not as perfect. But the inside is an explosion of sweet juice. I brought home a basket of them over the weekend and, when I cut into one, my kitchen suddenly smelled so good. I ate one just as it was but wanted to do something a little more special with the rest. 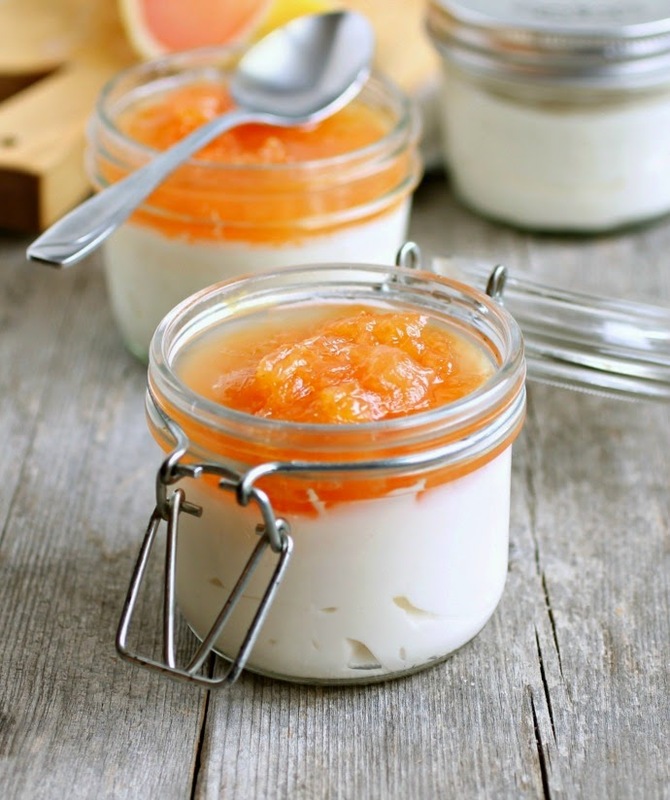 This compote is pretty light on sugar because the fruit itself is nicely sweet. And the combination of the sweet, tart, slightly bitter notes of a grapefruit go so well with the creamy tang of goat cheese and yogurt. Breakfast, afternoon snack, light dessert...I'll make good use of my basket of grapefruit. But I would still really like it to stop snowing. Enjoy! 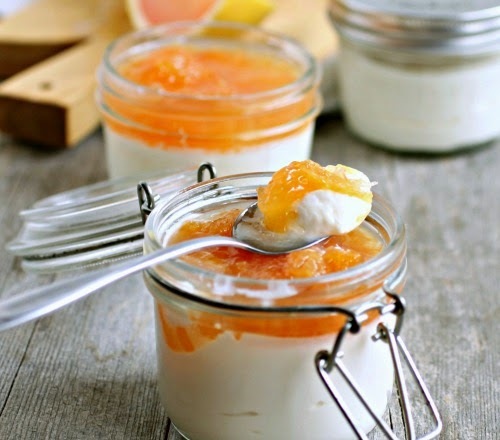 Make the compote by peeling the grapefruit and cutting in between the white membranes to get out the flesh. The white pith is bitter so try to get as much of it off as possible. Add the grapefruit segments along with the juice to a pot along with the sugar and salt. Cook on medium for about 10 minutes, stirring frequently, until the sugar has dissolved and the fruit softened. Allow to cool. Keep in mind that this is not a canning or preserving recipe but you can store the compote, in a covered jar in the refrigerator for a couple of days. Make the mousse by whipping together the heavy cream and sugar, either with a stand or hand mixer. Beat in the yogurt, goat cheese, vanilla and salt. Pour evenly into four 8 oz. jars or glasses and refrigerate for about an hour to firm up. 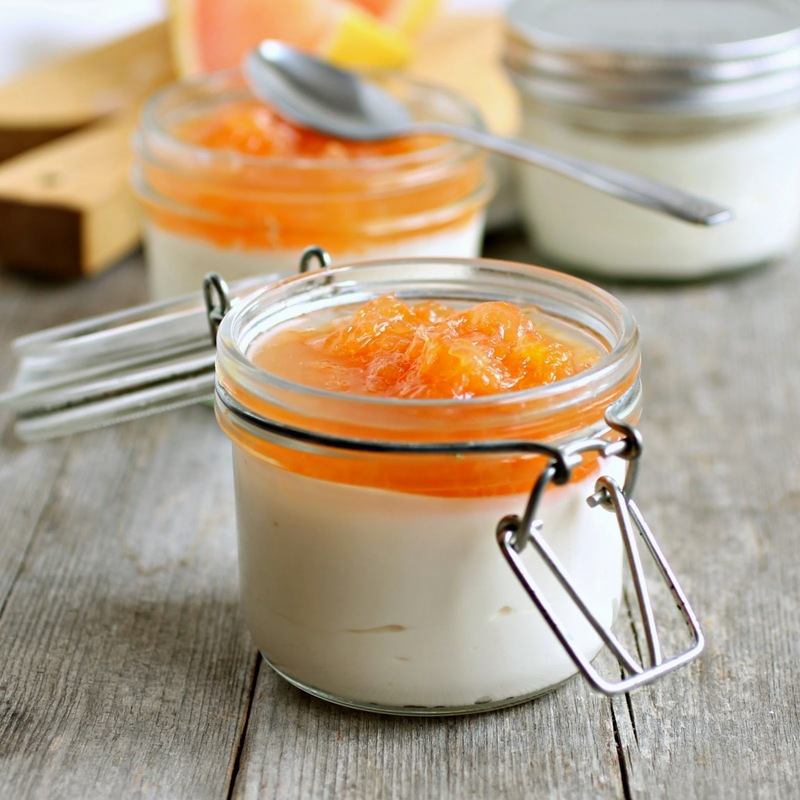 When ready to serve, top each with an equal amount of the grapefruit compote. This could not come at a better time! I have been obsessed with Grapefruit lately! This looks delicious and would certainly bring sunshine to these dreary winter days! I love panna cotta. This looks delish! Amazing looking recipe! 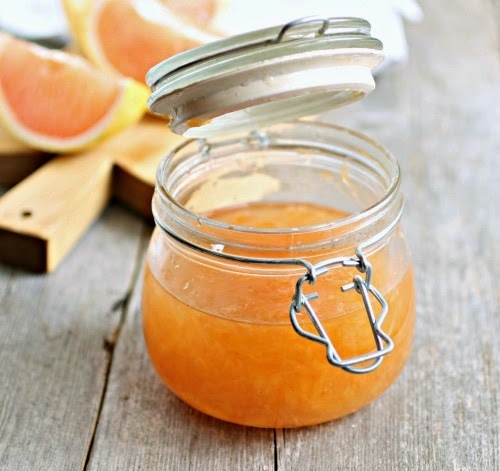 Great way to use grapefruits!